Karl Aage Præst (born 26 February 1922) is a Danish former football player. Playing in the left-winger position, Præst won two Serie A championship with Juventus. He played 24 games and scored 17 goals for the Danish national football team from 1945 to 1949 and won a bronze medal at the 1948 Summer Olympics. He is a Danish Football Hall of Fame inductee. Born in Copenhagen Præst started career with Østerbros Boldklub (ØB). At ØB, he played alongside Helge Broneé, Præst was acknowledged as a world class talent, with great balance, and dribbling, and a great end-product of either precise crossing or a good shot on goal, and also good free kicks taker. Præst signed Juventus on 1949. With Juventus, Præst won 1949/50 and 1951/52 Serie A championship. Præst played alongside John Hansen and Karl Aage Hansen at Juventus and his dribbling and crossing ability was a key in making John Hansen top scorer of the 1951-1952 season. 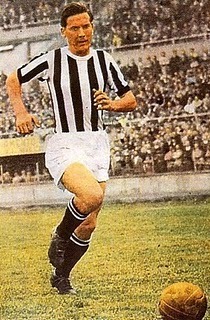 Præst played 239 games and scored 51 goals for Juventus from 1949 to 1956. Although I think passes speed are too high. I would lower 4 points both, the same with STA. And lower two points Res, Balance and AGI to make him more real.